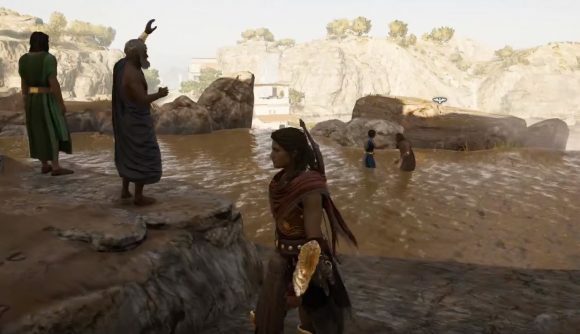 The war-ravaged ancient Greece featured in Assassin’s Creed Odyssey is a long way in both space and time from the futuristic Wakanda of Black Panther, but that didn’t stop Ubisoft from adding a pretty obvious nod to the hit film in Odyssey. In Black Panther, there’s a scene in which T’Challa fights a duel for his tribe’s crown against challenger M’Baku at a sacred arena at the top of a waterfall. It’s a brutal fight with high stakes, and at the end, T’Challa – the Black Panther – eventually emerges victorious, convincing M’Baku to admit defeat and recognize his rule. In Assassin’s Creed Odyssey, the south-eastern island, Messara (it’s Crete in the real world) has a sync point near its middle called the Gortyn Waterfall. You’ll have to climb them in order to activate the sync point, and in a pool that looks an awful lot like the setting of T’Challa’s duel with M’Baku, a crowd is watching two men duke it out at the edge of the falls. You can climb up and watch – or join in – the fight if you like, or see how it plays out with your eagle, Ikaros. Obviously, there are differences: the combatants here aren’t stripped to the waist, and the crowd watching is more excited than alarmed by what they’re seeing. But it’s hard to ignore the similarities in the setting, plus the fact that the short spears seen in Black Panther (including in the later duel T’Challa fights with Killmonger) look an awful lot like the Spear of Leonidas in Odyssey. If you’re not convinced, remember the quick “This is Sparta!” kick that Killmonger hits T’Challa with during their pivotal duel. Like its predecessors, Assassin’s Creed Odyssey is rooted in history, but the series has always taken its own liberties with the settings its chosen, and it’s always fun to see a respectful wink paid to other properties the developers have found inspiring.